It was yesterday but why not celebrate it twice? 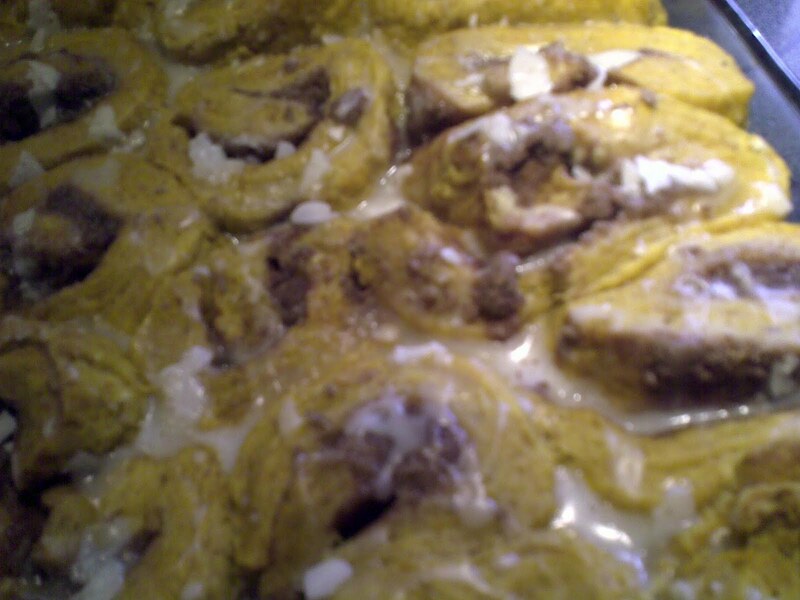 I made those amazing pumpkin cinnamon rolls from “Don’t Eat Off The Sidewalk” again. Why mess with something fantastic? We’ve been doing some happy eating the last week including this terrific potato loaf that I got the recipe for from the organic guy. Simply; boil 4 medium potatoes and 1 medium carrot until tender. Roughly mash and add; 1 cup flour, 1/2 cup yogurt, 1 tsp. baking powder, salt and pepper to taste, 2 eggs, 1/2 cup oil and 1/2 cup chopped cilantro or dill. Bake in a loaf pan for 30 min. at 350 degrees until firm and golden brown on the top. Great hot or cold. I totally blanked on taking a photo of the loaf but it is pretty enough to serve to company but easy enough to make at the last minute. 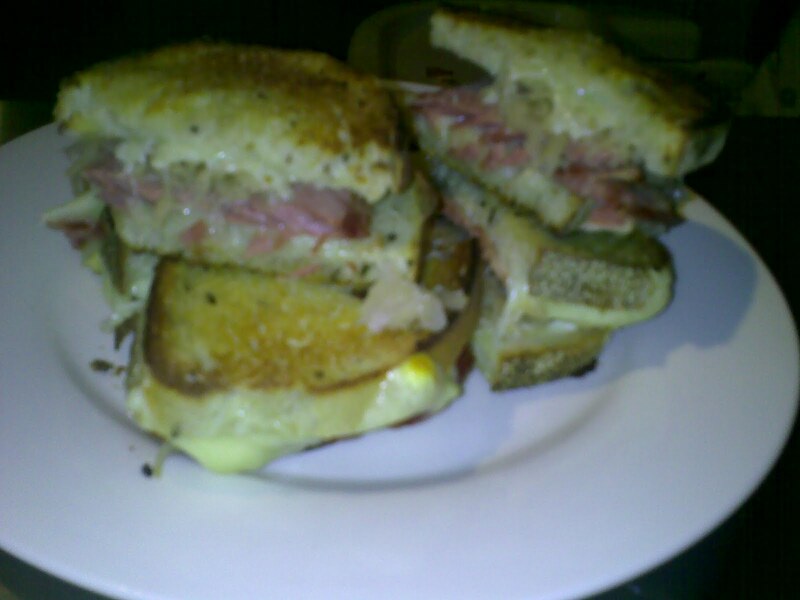 I did take a picture of our yummy reuban sandwiches though. I found a brisket on sale and “corned-it” in a solution of; 1/2 water, 1/2 vinegar, a handful of pickling spice and boiled the whole thing until it was cooked through (about 1/2 an hour). You then let the meat cool in the brining liquid and slice when at room temp. I had some nice cheese, sourkraut and rye bread. Serve with dill pickles. Last night was all about a roast of pork that I brined overnight (1 T. juniper berries, 1/2 cup brown sugar, 1/2 vinegar, 1/2 water, thyme, oregano and chilli flakes to taste), scored the skin and cooked at a high heat to get a nice crackling on the top. 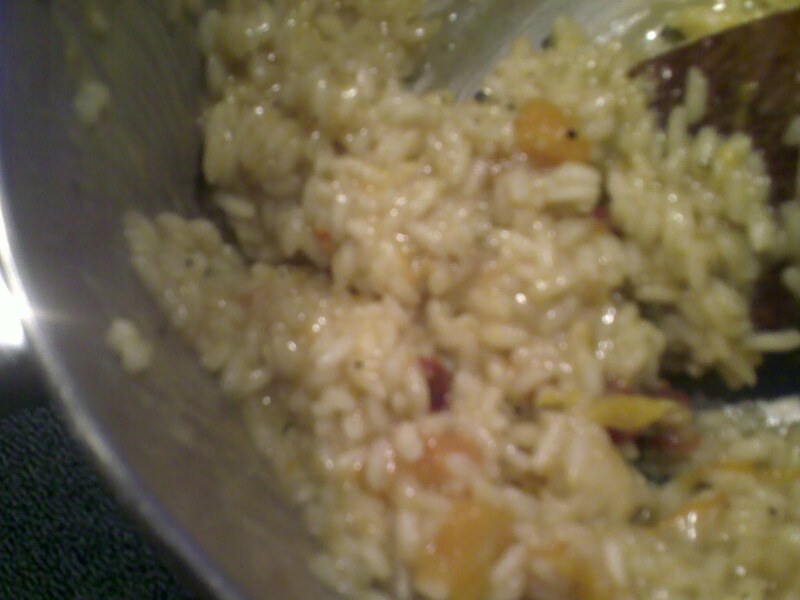 I made a quick squash and sundried tomato risotto and we had fresh, sliced tomatoes. 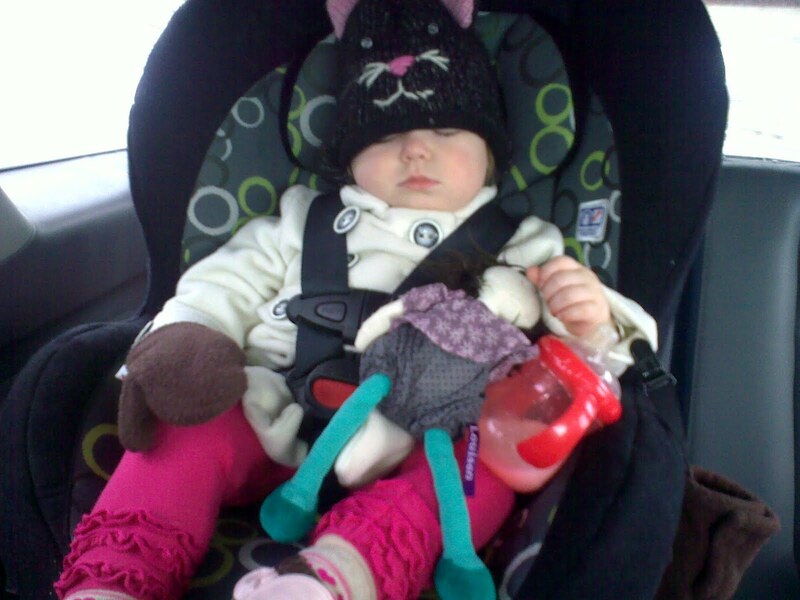 The baby was a big fan of it all but not a fan of her carseat. Tonight is swimming night with the wee, so I have pea soup in the slowcooker that should be ready for when we get home. On a side note: Thanks to all my friends this weekend who weathered another birthday with me-it’s not easy. I don’t know why I dislike them so much and why they get me down for almost a whole month but at least now I try and keep quiet about them.